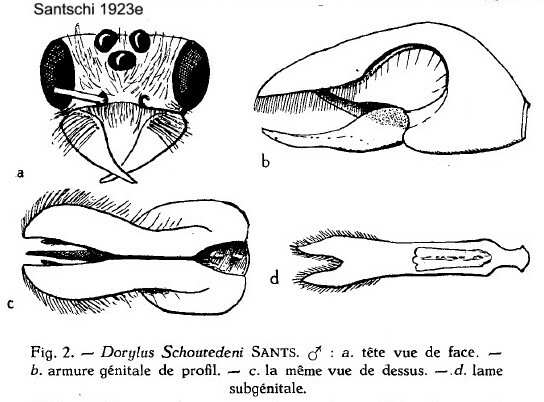 Santschi's (1910g) gave a collection of drawings of male heads, this is at .
. Alitrunk dorsum without any pilosity and variable pubescence . 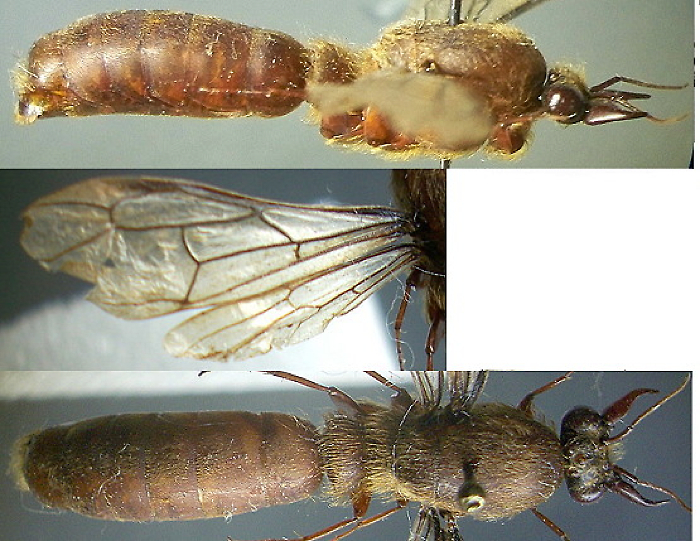 3 Brown, with a dark head, brown wings; TL 22-24; mandible apparently quite long and sharp . 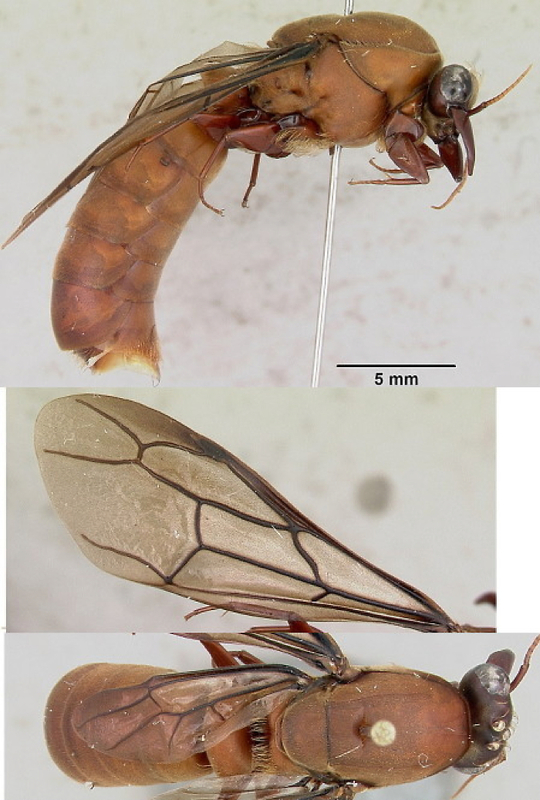 -- HW 3.2 mm; wing 14 mm; overall dull yellow-brown ..
-- Promesonotum almost glabrous, also missing on much of the gaster; generally submatt, apex of gaster smooth and very shiny; TL 21 mm, PW 3.7, red. 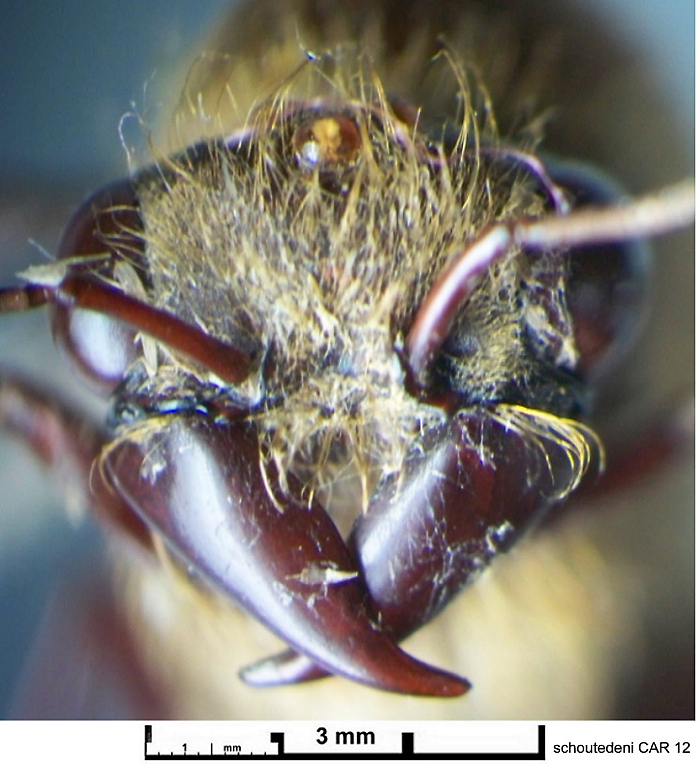 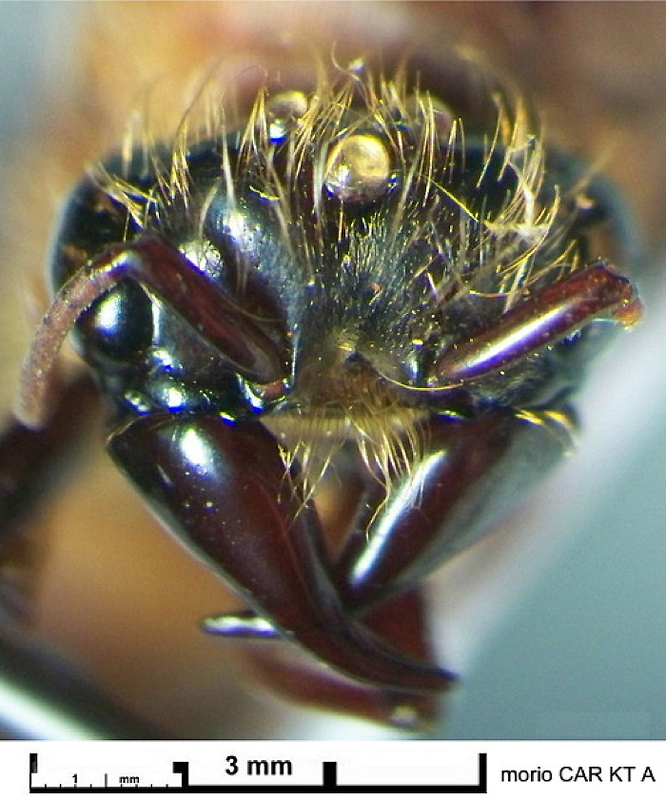 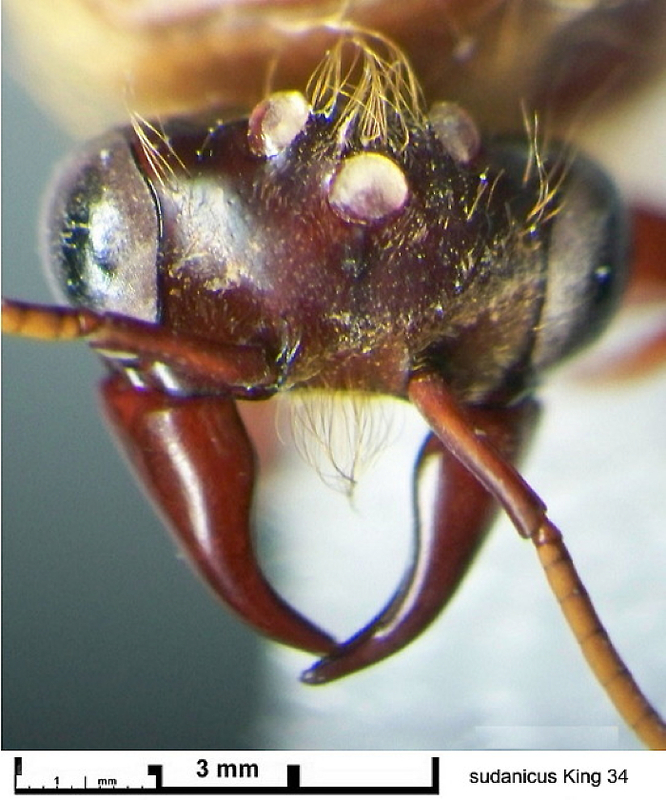 head dull red, mandibles, antennae and legs reddish-brown; several large blond hairs on the clypeus and dorsum of head, a weak tuft between the ocelli; scape almost reaching the occiput; second segment of funiculus pubescent below .
. 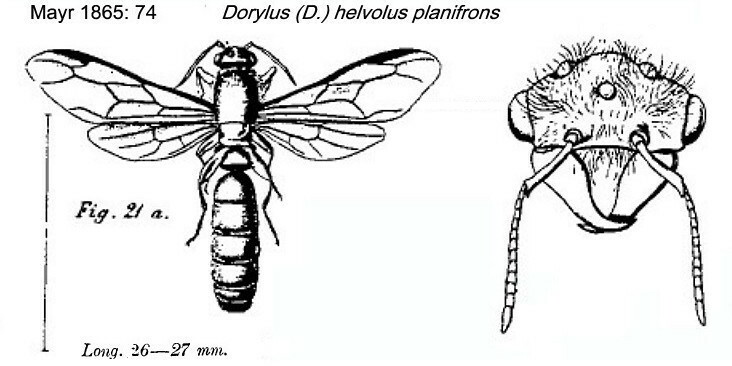 Essentially dark brown to black species . 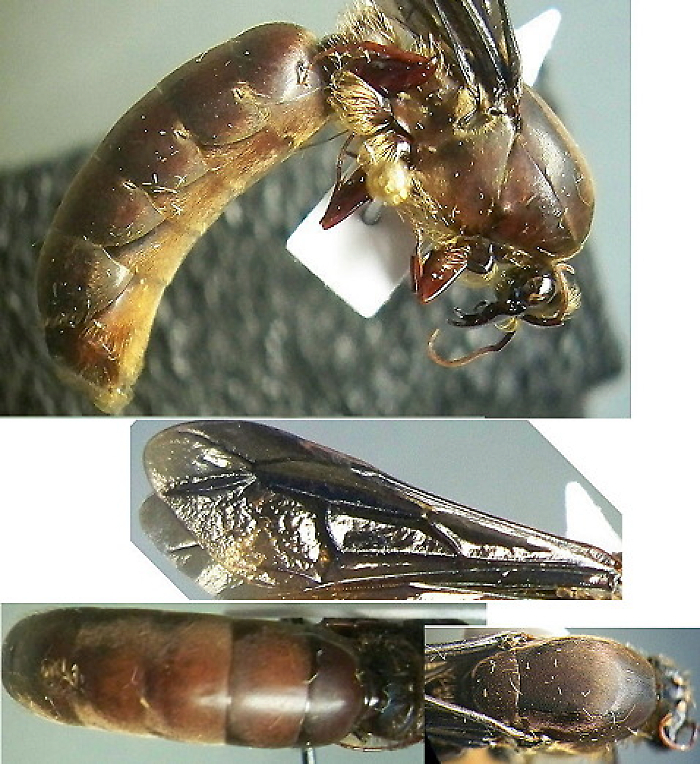 4A TL 19 mm, black, matt, with dark wings, with black nerves; pubescence silky brown; pronotum and mesonotum very short; scape more than half the length of the funiculus; . 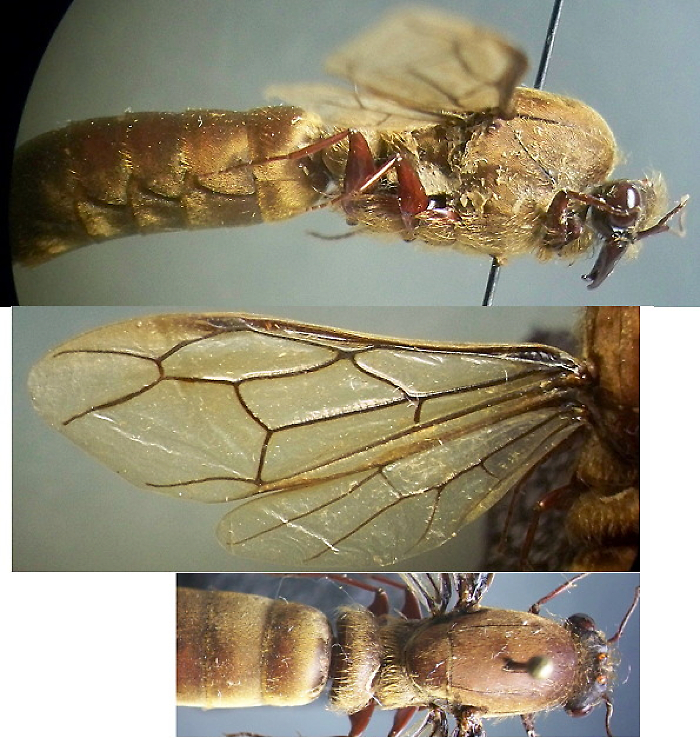 -- TL 20-22 mm, PW 4-4.5; dark brown; wing dark brown . 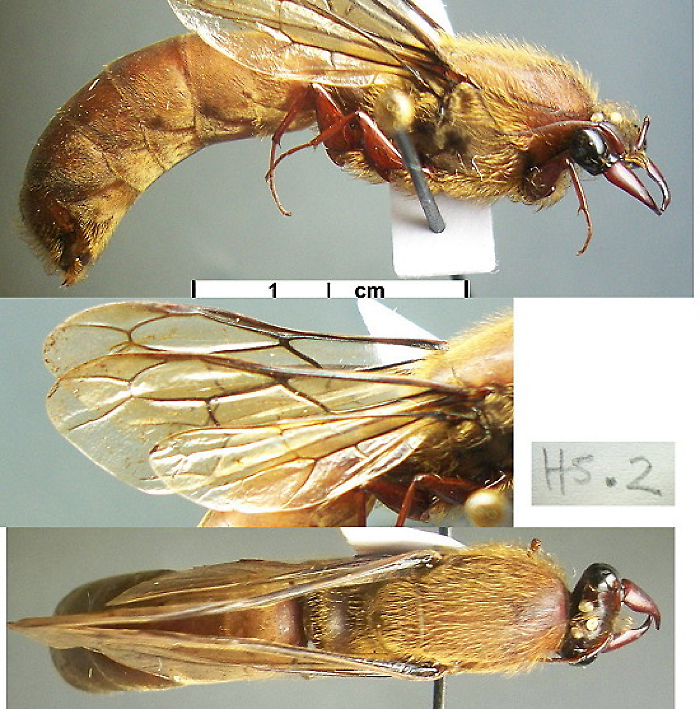 wing > 16 mm; scape as long as up to the 6-7th segments of the funiculus; body blackish-brown; head brown-black; wing yellowish . 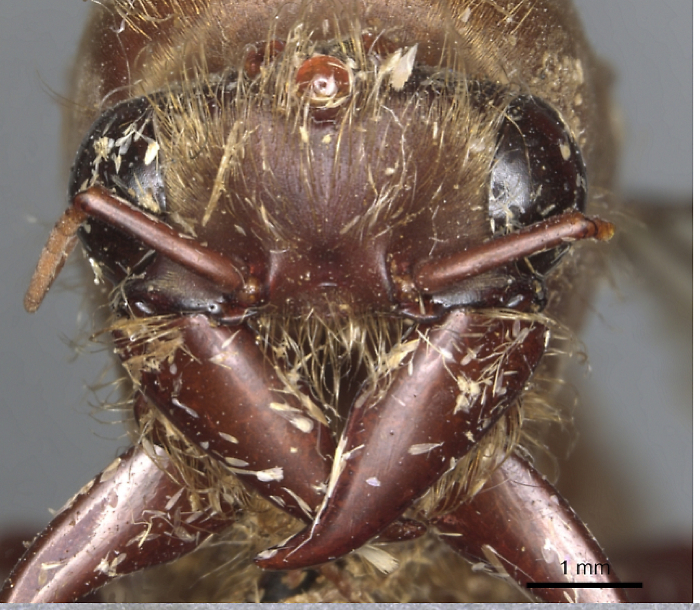 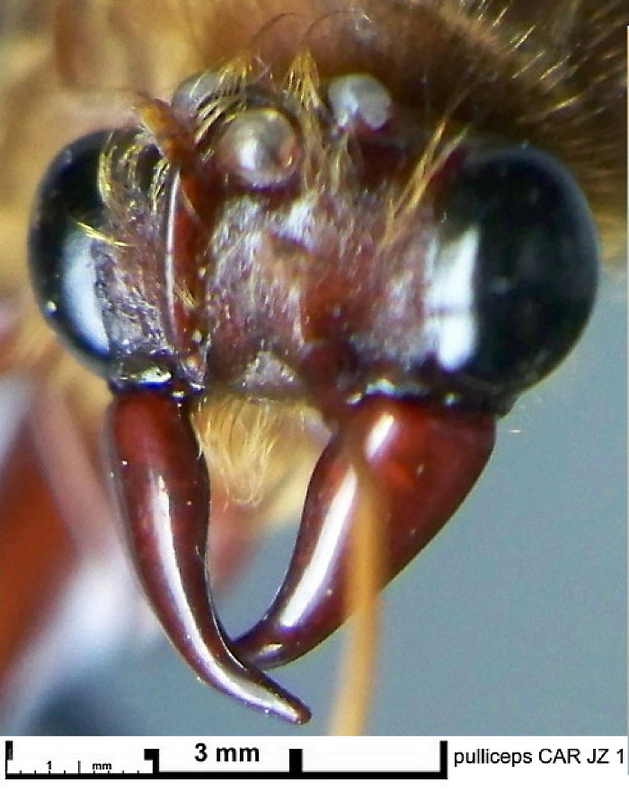 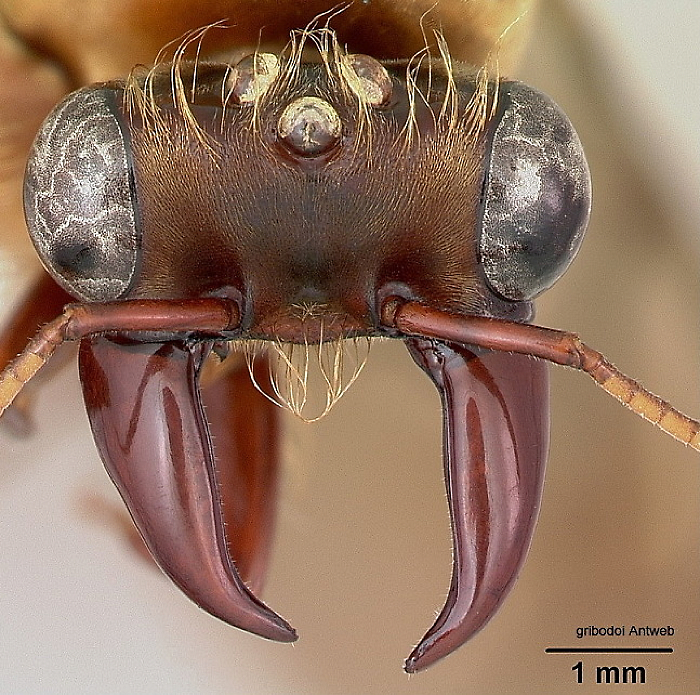 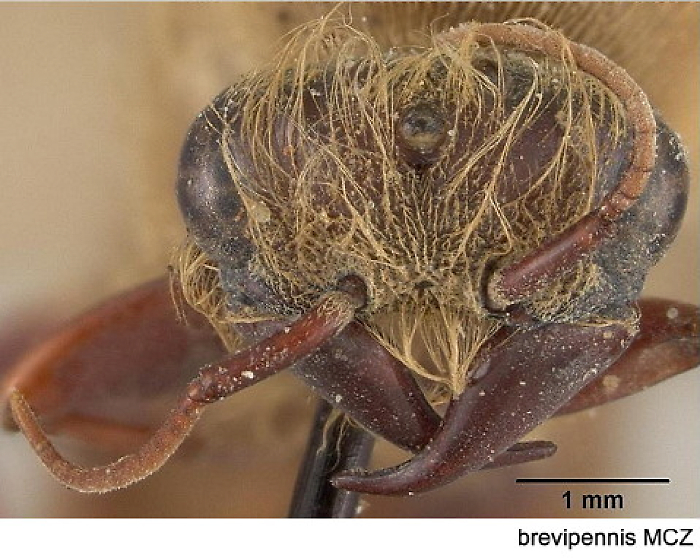 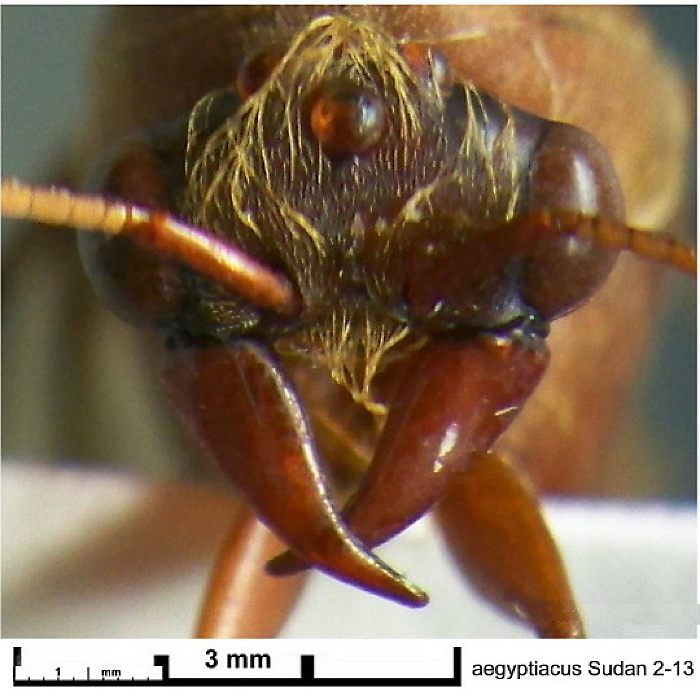 -- TL not given (from Antweb photos) wing 12 mm; mandible shorter; dark brown, head more red-brown .
. Alitrunk with abundant erect hairs on the dorsum . 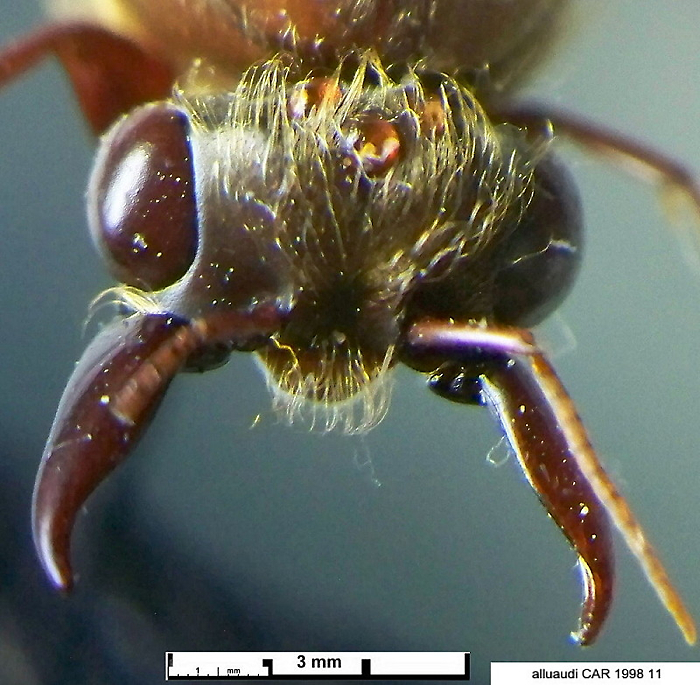 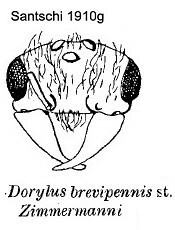 Mandibles with hairs on the basal one-third . 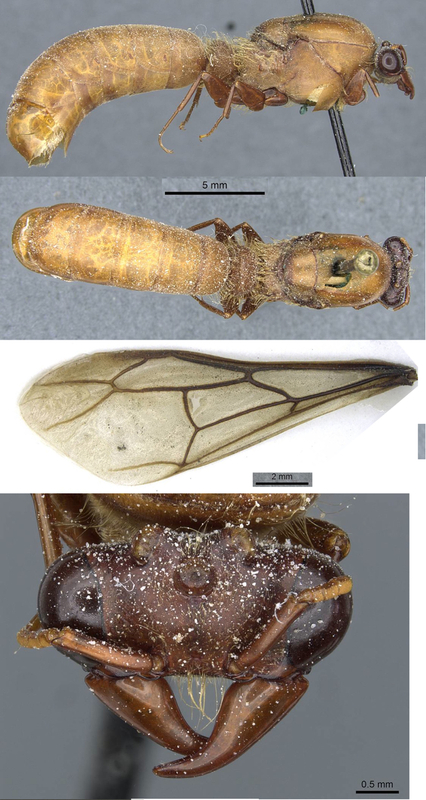 6 TL 25-27 mm, HW 4-4.2, PW 4.8-5, wing 17 mm; head with posterior and superior surfaces flat; scape less than half as long as the funiculus; mandibles with long hairs on the basal one-third; shiny dorsally, sides of alitrunk matt; rust, gaster darker . 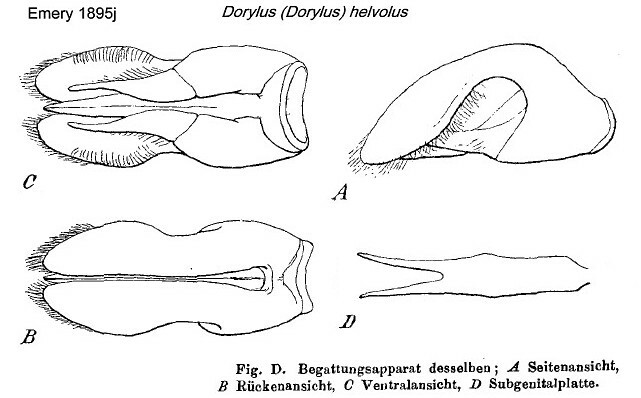 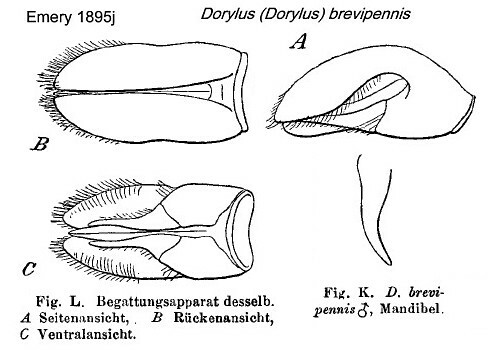 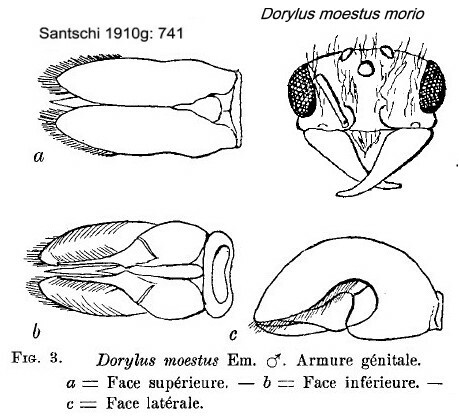 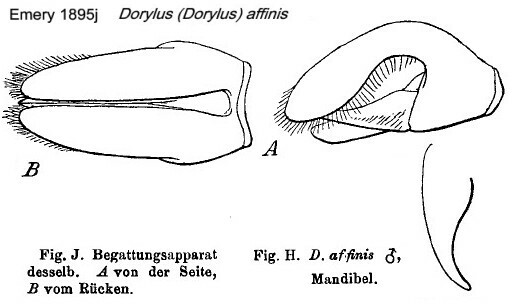 Mandibles without hairs on the basal one-third . 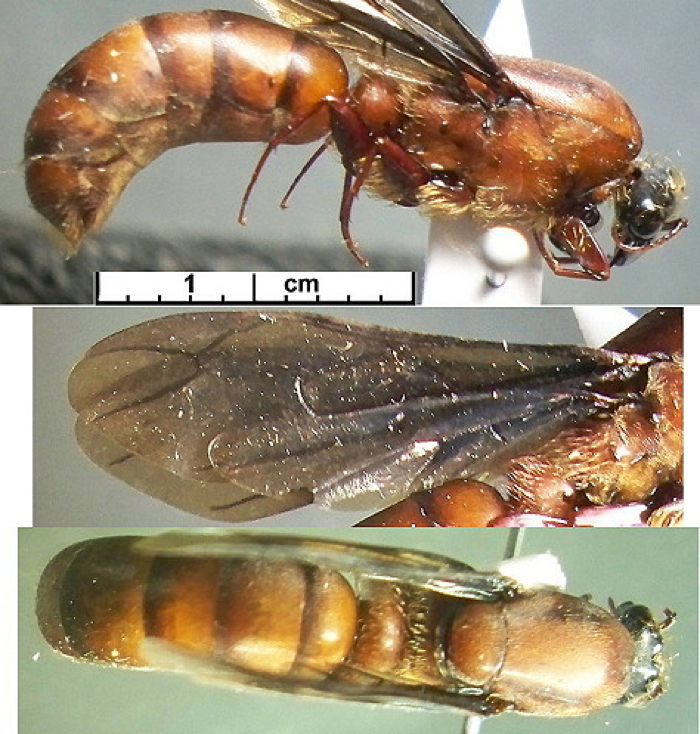 9 Whole of gaster covered with raised pilosity that is slightly less abundant than on the alitrunk; reddish-yellow, head, mandibles and legs generally reddish, wings feebly tinted with brown, sometime with a violaceous reflection; TL 21-22 mm, HW 3.7, PW 3.6, wing 15-16; pubescence thinner than affinis; funiculus thicker than affinis, second segment slightly longer than the first . 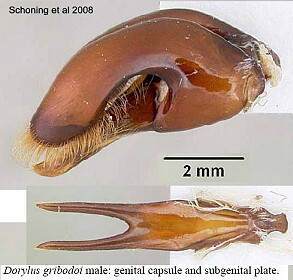 Gaster without erect pilosity except on the apical segment . 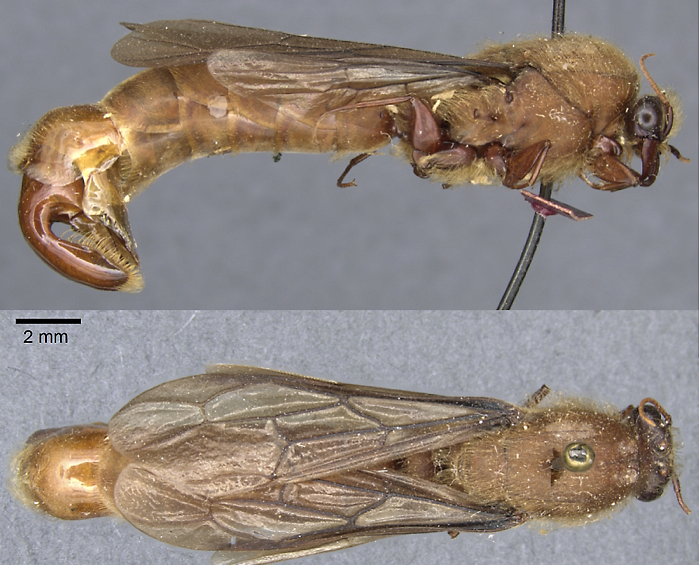 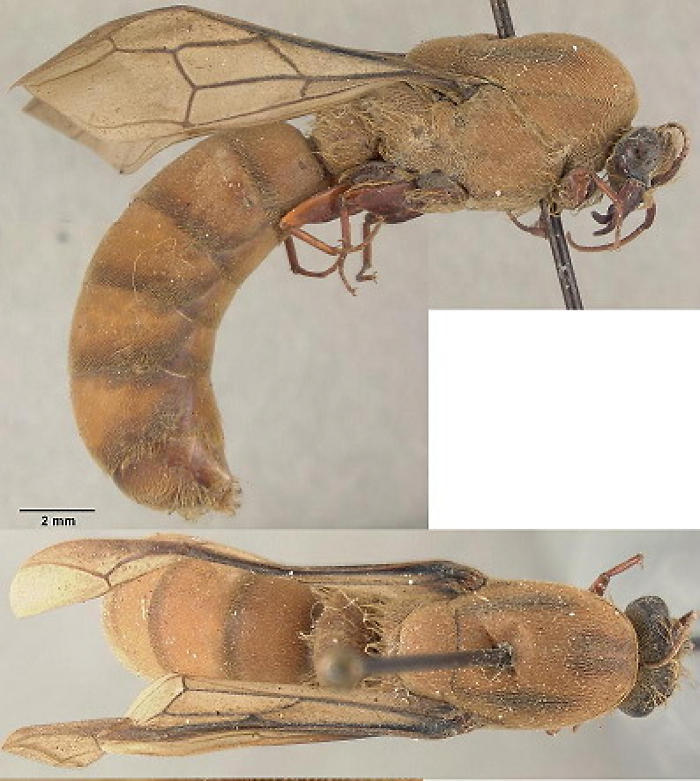 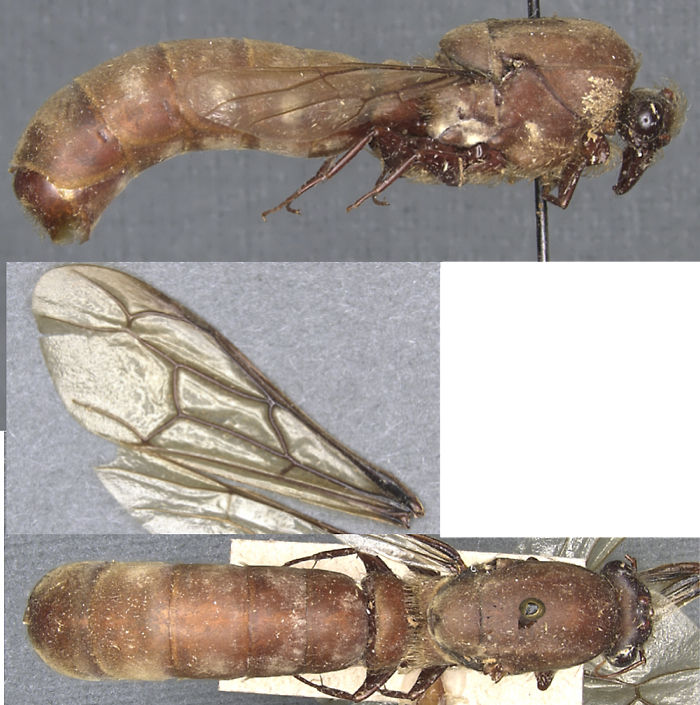 12 TL ca 22.2 mm, PW ca 4 mm, wing ; scape as long as up to the 6-7th segments of the funiculus; alitrunk with short hairs but dense pubescence hiding the sculpturation; reddish-testaceous, head similar except occiput very dark chestnut; wings sub-hyaline, veins dark brown . 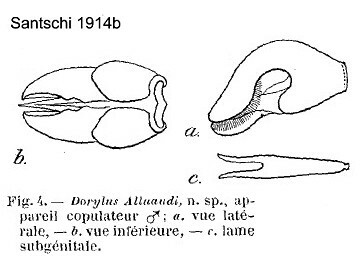 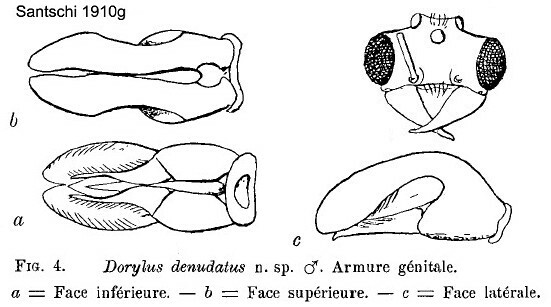 -- Near to affinis; TL ca 26.5 mm; apex of mandible uniquely flattened; erect hairs on alitrunk semidecumbent but much denser than affinis, also in a regular longitudinal arrangement (scruffy in affinis type); mandibles a dull mahogany red; surface of head and alitrunk finely but distinctly sculptured . 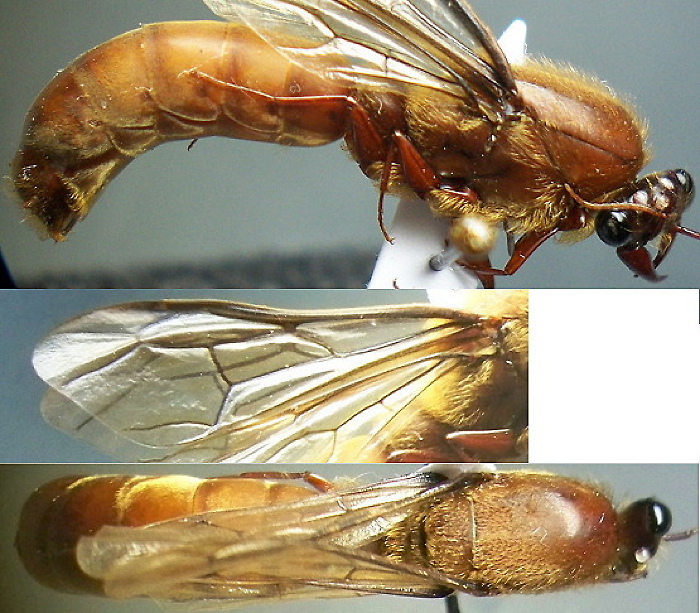 � TL 27 mm, PW 5 mm; dark brown-yellow; scape as long as half the funiculus and reaching the 7th segment .
. Scape reaching only about the 5th segment of the funiculus . 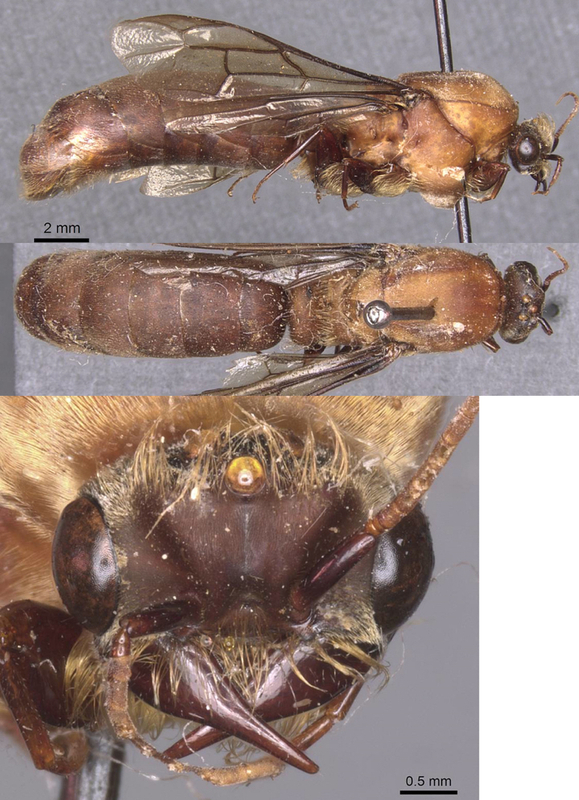 13 Head blackish, body reddish-brown; TL 20-21 mm, HW 3.8, PW 3.8, wing 14-14.5; alitrunk appears shiny as the pubescence is scarce; pubescence more abundant on gaster [?? 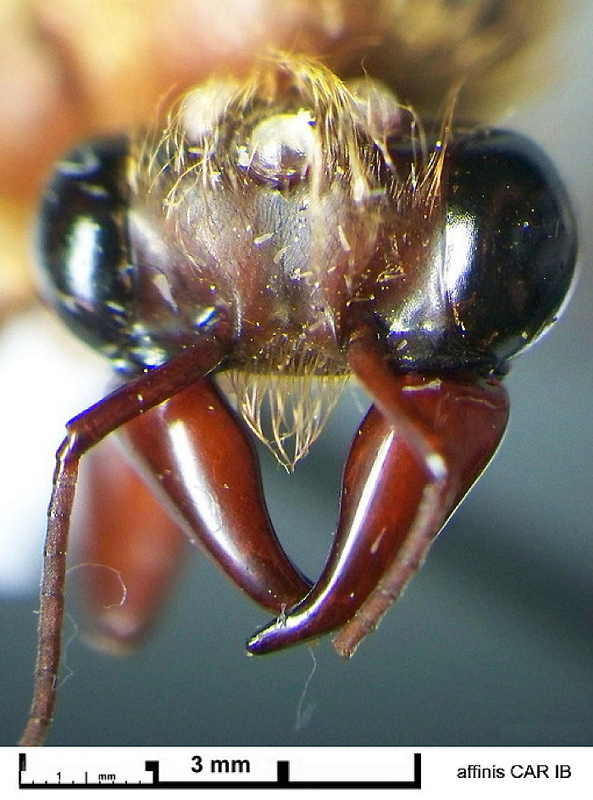 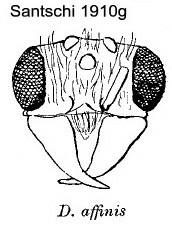 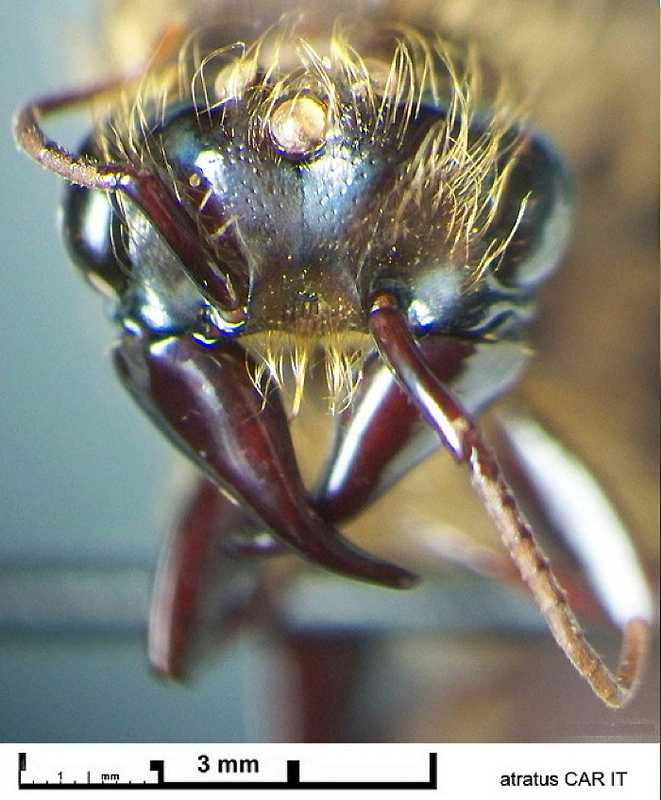 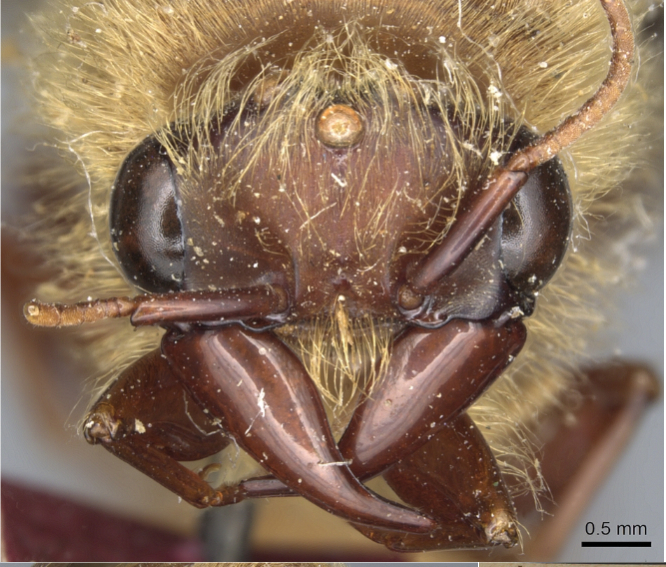 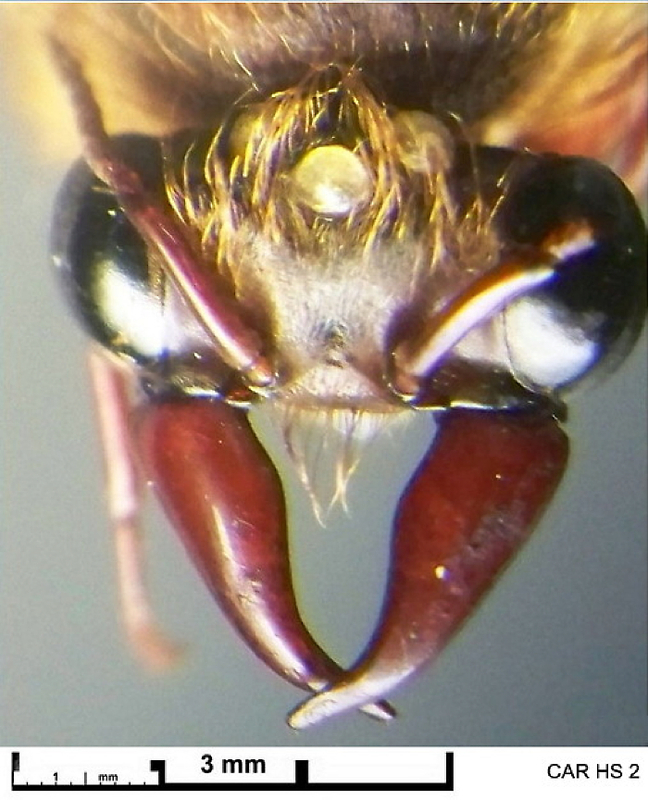 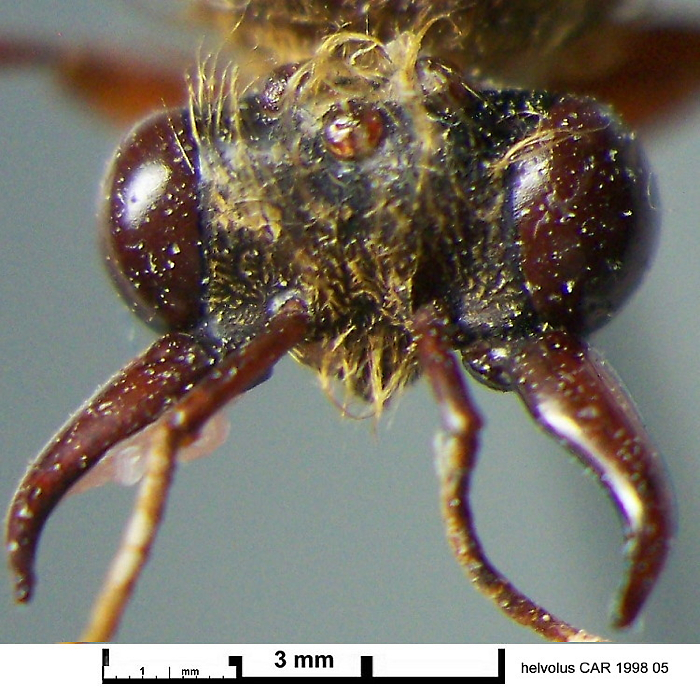 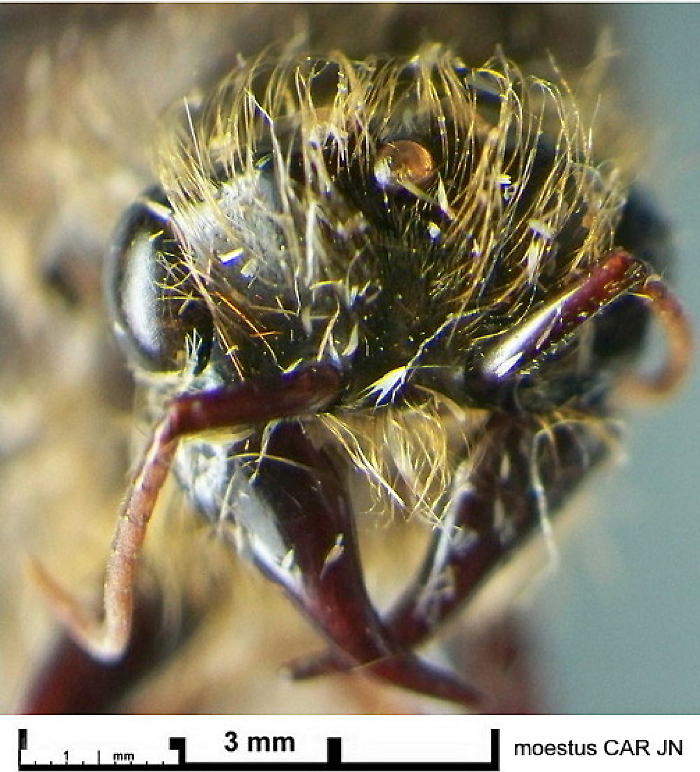 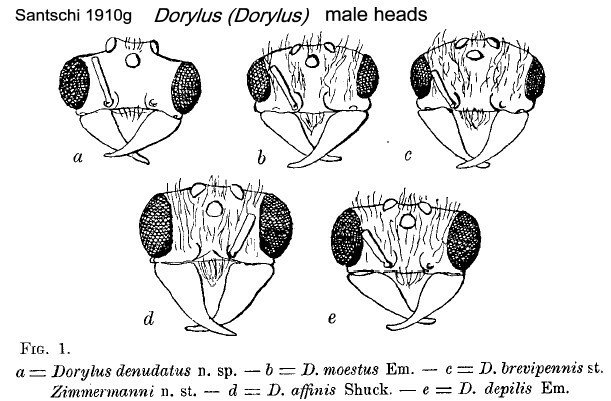 funiculus with first two-three segments fuscous, the remainder yellowish] .
. Upper border of head more or less convex (oblique from the ocelli to the compound eyes); from above the line from the neck to the compound eyes is weakly concave . 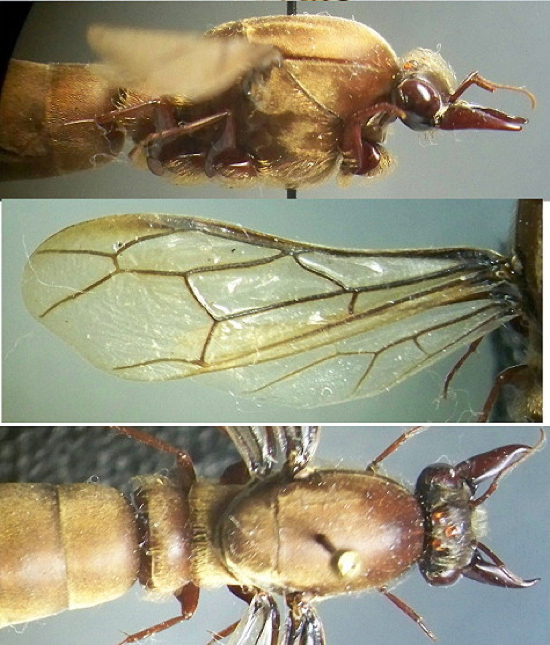 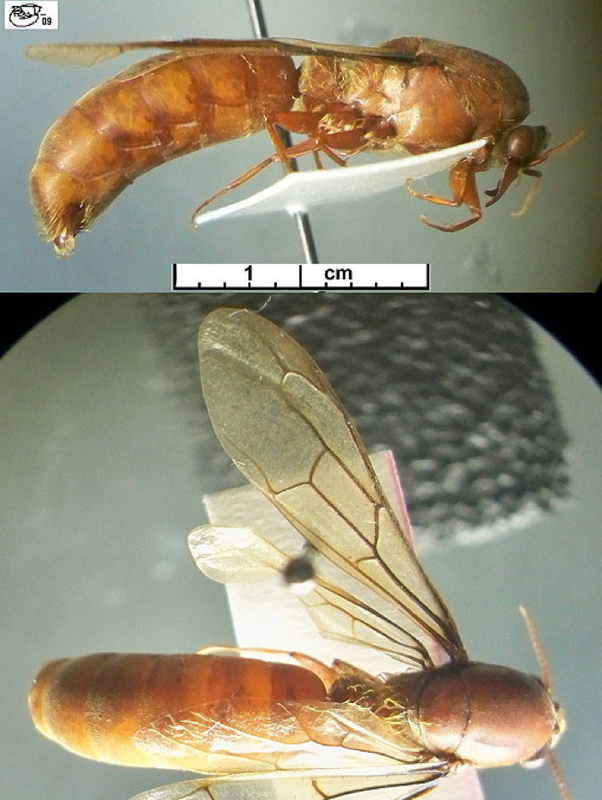 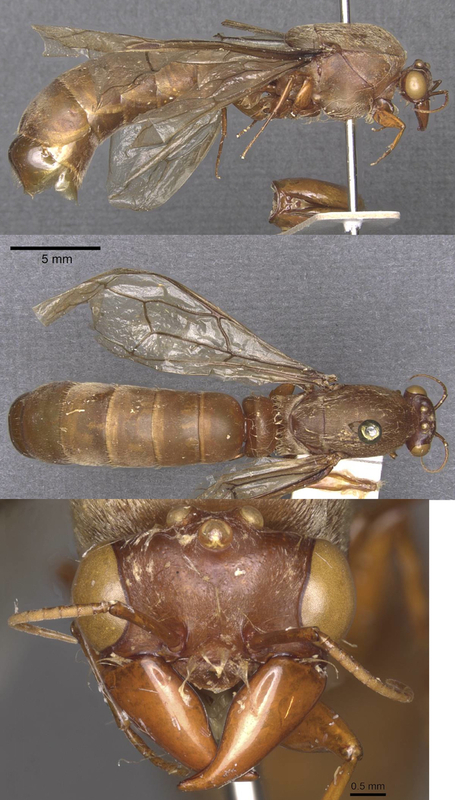 14 TL 26-27 mm, PW ca 5.0; pronotum, mesonotum and scutellum with many long hairs; scape as long as up to the 6-7th segments of the funiculus; overall reddish-yellow, head brown; antenae and legs red; desnsely pilous; gaster pubescent, legs without hairs; mandibles and scape shiny . 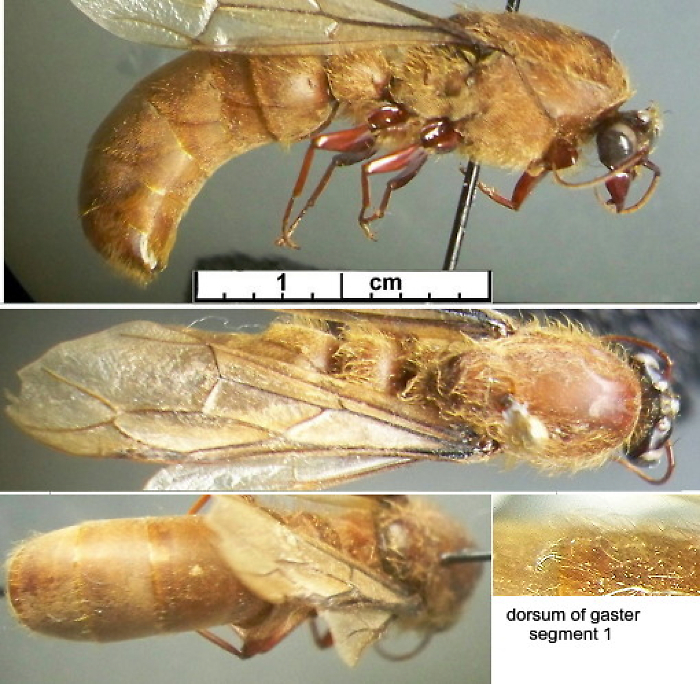 16 Gaster without erect pilosity on segments 3, 4 & 5; pubescence thinner than affinis; TL ca 23 mm; PW 3.5, HL+AL =8-9 mm; darker than type, wings weakly yellowish . 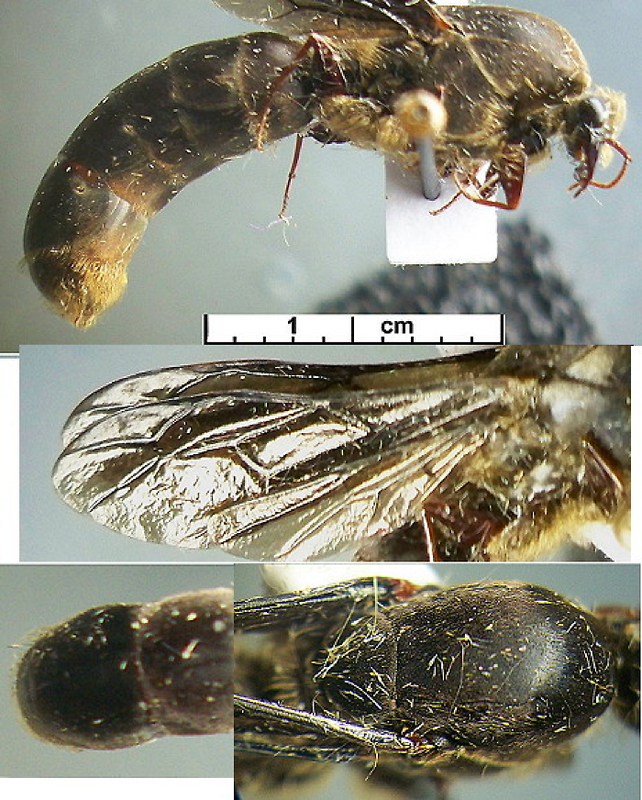 -- TL 23-24 mm; short mandibles; dark red-black; wings longer and darker than gaudens . 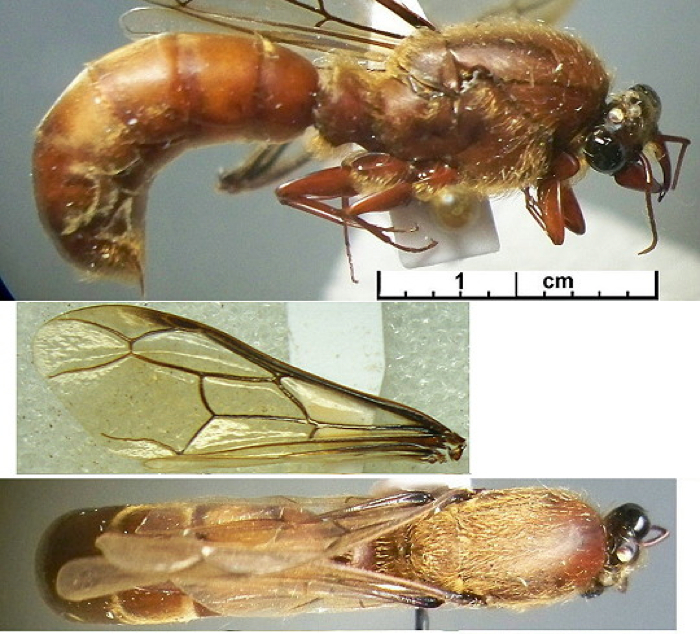 17 TL 20-21 mm, PW 4 mm, wing 12.5; scape short, only as long as up to the fifth funiculus segment; dark yellow-brown; head and mandibles dark brown; the margins of the gaster segments brownish; wings short, pale yellow with dark veins .